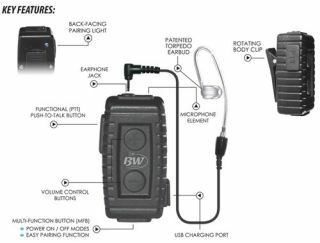 The Ear Phone Connection, a developer of two-way radios audio accessories, revealed that its new Nighthawk Bluetooth Microphone Combo System will feature a universal recording app that will allow Apple and Android users to wirelessly record high-quality audio at distances to 120 feet with full remote control capabilities. The Nighthawk with recording app will debut at the 2013 International CES show (CES Booth LVH – 56016) January 8-13 in Las Vegas. The Nighthawk is the ideal tool for mobile consumers, power users as well as content developers and field personnel who need a Bluetooth earphone solution with high-quality wireless recording capability for their Apple and Android smartphones, the company says. With the recording app and integrated start/stop recording function, the Nighthawk functions as a wireless interview microphone delivering consistent audio levels recording directly to the user’s smartphone. Users can clip microphone to themselves, the interview subject, or capture any other audio and record audio to video on their smartphone from up to 120 feet away. The audio level is consistent, making the Nighthawk an ideal companion for conducting professional interviews, recording lectures, meetings, or taking simple voice memos. An integrated recording start/stop function lets users easily control recordings. “The clarity of our microphone and the ability to reduce ambient sound due to the directional microphone are great benefits to consumers and audio pros,” said Ruben Scheimberg, founder of the Ear Phone Connection. "The Nighthawk offers a much more complete package because it is not just a headset but is also a multi-function wireless microphone, recording device and Bluetooth device controller." The Nighthawk Bluetooth Microphone Combo System will be available beginning January 2013 with an MSRP of $124.99.